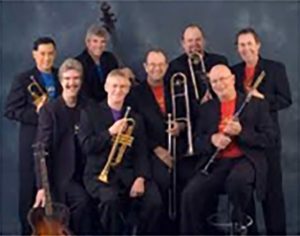 The Classic Jazz Band started in Orlando, Florida in 1990 with a group of former musicians of Walt Disney World and Rosie O'Gradys. They started essentially as a “kicks” band, collecting and playing the arrangements of Matty Matlock and Billy Maxted. After performing at a few jazz festivals, they realized that there was a real market for their “little big band” type of sound. That was more than 25 years and 14 recordings ago. Going to a Classic Jazz Band Concert is much like attending a symposium on the history of jazz. You will hear anything from Jelly Roll Morton to Count Basie and all the stops in between. The band uses the five-horn front line typical of such bands as those of Matty Matlock, Billy Maxted and Red Nichols.